The global wearable camera market is primed to grow at a solid pace on account of the soaring popularity of tourism, adventure, and sports, swift penetration of internet in most corners of the world, and an explosive growth in social media users. Besides, an array of products to suit every need and budget, and competitive pricing on account of strong competition among players is also serving to boost uptake in the market. Currently, the global wearable camera market is fragmented in nature because of the presence of numerous national and international players. In the years ahead, the market is expected to see foray of new players which increase the degree of competition. In order to steal a march over their competitors, companies are focusing on product development and affordable pricing strategy. 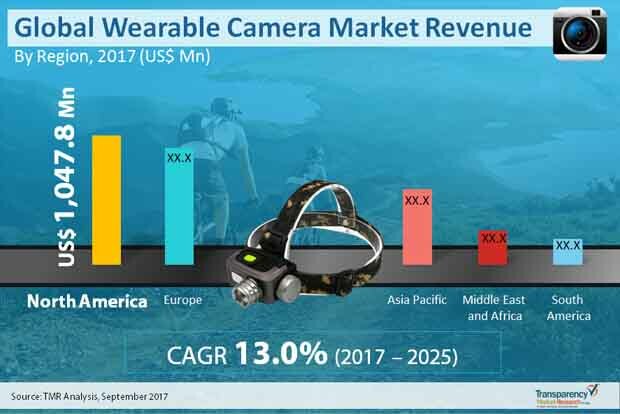 According to Transparency Market Research, the global wearable camera market will likely rise at a solid CAGR of 13.0% from 2017 to 2025 to become worth US$8.12 bn by end of 2025 from US$2.71 bn in 2016. Application-wise, the global wearable camera market can be segmented into sports and adventure, healthcare, security, etc. Of them, the segment of sports and adventure contributed the most to the revenue in the market in 2016. This is because wearable cameras can be used to capture various actions with low distortion frames. Use of wearable cameras in sports such as sky diving, mountain cycling, and trekking is rising on account of their small size, which makes it easy to carry them. In next couple of years too, the sports and adventure segment is expected to continue contributing to revenue substantially. Besides the sports and adventure segment, the segment of security is also a key contributor to revenue because of the rising use of wearable cameras in different security applications such as spying, gathering video evidence, and capturing assaults or offenses in the crime scene. In the healthcare sector, use of wearable cameras having artificial intelligence and 360-degree technology, compact structure, and low cost are majorly serving to boost sales. Geographically, Europe is projected to rise at a maximum pace by clocking a CAGR of 13.7% from 2017 to 2025. This is mainly on account of the rising usage of internet and increase in sports activities. Another reason for the market growing at a healthy clip is the presence of several international players in the region who are coming with new types of wearable cameras having better functionalities such as inbuilt artificial intelligence, Wi-Fi, and Bluetooth. Germany and the U.K. are at the forefront of driving expansion in the Europe market. In terms of market share, however, it is North America that outshines all other regions on the back of growing tourism in the region and also rising interest in various types of adventures and sports. Emergence of products with advanced features such as water-proof, GPS connectivity, 720p recording, and internal storage at lower price is also proving beneficial to the market. By registering a CAGR of 12.9% in the forecast period, the region is expected to pull in a revenue of US$2.77 bn by 2025. Asia Pacific is another key market that is being powered mainly by China, India, and Japan. GoPro Inc., Garmin Ltd., Xiaomi, Sony Corporation, Narrative AB, Pinnacle Response Ltd., Axon Enterprise Inc., Rollei GmbH, Contour, LLC., and Vievu LLC. are to name a few prominent participants in the global wearable market. The Wearable Camera Market (Application- Sports & Adventure, Security, Healthcare, Other; Sales Channel- Online, Offline) – Global Industry Analysis, Size, Share, Growth, Trends and Forecast, 2017 – 2025, report provides analysis of the wearable camera market for the period 2015–2025, wherein the years from 2017 to 2025 is the forecast period and 2016 is considered as the base year. Data for 2015 has been included as historical information. The report covers all the major trends and technologies playing a major role in the wearable camera market growth over the forecast period. It highlights the drivers, restraints and opportunities expected to influence the market growth during this period. The study provides a holistic perspective on the market’s growth in terms of revenue (in US$ Mn) and volume (thousand units) across different geographical regions, namely North America, Europe, Asia Pacific, Middle East & Africa and South America. Report highlights the key trends affecting the market on a global scale. Furthermore, region wise prominent countries/regions covered in the report includes - The U.S, Canada, Germany, France, the U.K., India, China, Japan, GCC, South Africa and Brazil. The market overview section of the report demonstrates the market dynamics such as the drivers, restraints, opportunities, trends that is expected to influence the current nature and future status of this market. Key indicators mentioned in the report, provide a robust view about the vital factors that led to the strong adoption of wearable cameras around the globe. The key indicators also provide significance of the factors which are capable of changing the market scenario. These indicators are expected to define the market position during the forecast period. An attractiveness analysis has also been provided for every segment in the report, in order to provide a thorough understanding of the overall scenario of wearable camera market. Moreover, the report provides an overview of various strategies adopted by the key players present in the market. The report also includes key industry developments covering significant advances made by leading market players over the period of time. The report segments the market on the basis of application, sales channel and region. The application segment includes sports & adventure, security, healthcare and other. Sales channel segment includes two segments which are online and offline. The report also highlights the competitive landscape of the global wearable camera market, thereby positioning all the major players according to their presence in different regions of the world and recent key developments initiated by them in the wearable camera market. The comprehensive wearable camera market estimates are the result of our in-depth secondary research, primary interviews, and in-house expert panel reviews. These market estimates have been analyzed by taking into account the impact of different political, social, economic, technological, and legal factors along with the current market dynamics affecting wearable camera market growth. This report provides all the essential information required to understand the key developments in wearable camera market, growth trend of each segment and strategy of each company that helps them to efficiently compete in the market. Also, the report provides insights related to trends and its impact on the market. Furthermore, Porter’s Five Forces analysis explains the factors which are currently affecting the Wearable Camera market. GoPro Inc., Garmin Ltd., Xiaomi, Sony Corporation, Narrative AB, Pinnacle Response Ltd., Axon Enterprise Inc., Rollei GmbH, Contour, LLC. and Vievu LLC are some of the major players operating within the wearable camera market profiled in this study. Details such as financials, SWOT analysis, business strategies, recent developments, and other such strategic information pertaining to these players have been duly provided as part of company profiling.